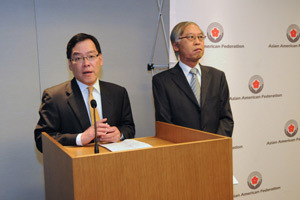 ﻿The Asian American Federation is proud to announce its 2011 Asian American Community Fund Grant Awards. This year, the Federation awarded a total of $170,000 in capacity building and program service grants to 7 member agencies. 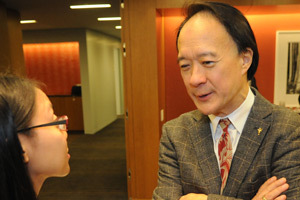 The Federation presented the awards at a ceremony and reception on December 5th, 2011 at Haynes and Boone, LLP. ﻿Since 1993, the Federation has supported critical programs for Asian American individuals and families through its annual Community Fund, awarded to local community organizations in a competitive application process. The goal of the Community Fund is to enable groups to create new and innovative programs, sustain critical services, and respond to the needs of our city's growing Asian American population. Since its inception, the Fund has raised and awarded over $3 million dollars to more than 100 worthy community programs. 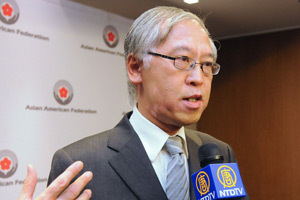 Watch interviews with grantees provided by New Tang Dynasty Television HERE, other PRESS COVERAGE and PHOTOS. One recipient, the New York Asian Women's Center was awarded a program grant to provide direct immigration legal services to Asian domestic violence and human trafficking survivors, and develop a sustainable volunteer legal services program. Another grantee, South Asian Youth Action received a capacity-building grant to strengthen organizational sustainability, deepen program efficacy and quality, and increase the number of South Asian youth served in their afterschool programs. Sincere thanks to the Community Fund's Allocations Committee, and Haynes and Boone, LLP for generously hosting us, and congratulations to the 2011 Community Fund Grantees!